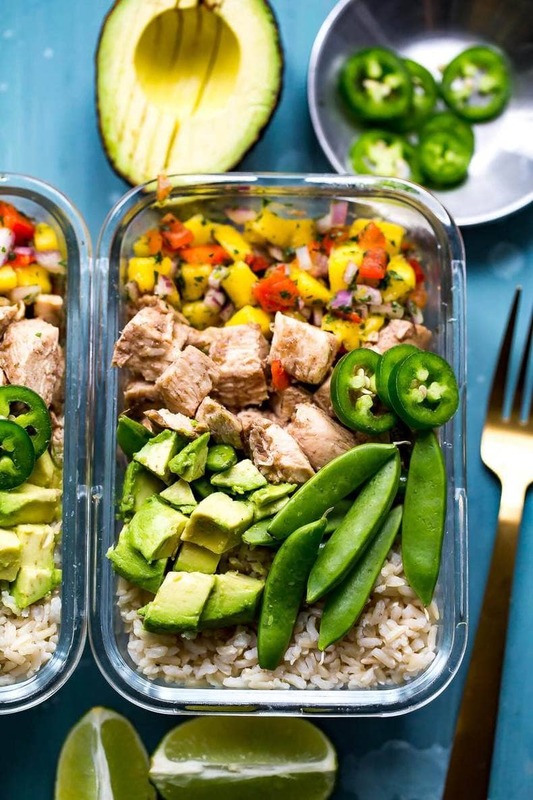 These Meal Prep Jerk Chicken Rice Bowls are the most delicious Caribbean-inspired lunch idea with mango salsa, avocado, jalapenos and brown rice! Preheat oven to 425 F. In a food processor or Magic Bullet, blend all ingredients for Jerk marinade together. Pour overtop of chicken in an oven-safe dish and bake for 20-25 min until chicken is fully cooked. Meanwhile, mix together mango salsa and cook rice according to package directions on the stovetop or in a rice cooker. Remove chicken from oven and let cool. Cut into 1-inch cubes and toss in remaining sauce from oven-safe dish. Add rice, chicken, snap peas, mango salsa, diced avocado and sliced jalapenos to each bowl. Serve and enjoy!